Sebastien Ogier is all smiles after wrapping up victory in Faro. (CNN) -- France's Sebastien Ogier underlined his growing promise with a storming drive to win the Rally of Portugal, his maiden victory in the world championship. The 26-year-old led a sweep of the podium positions for the C4 Citroen team with reigning world champion Sebastien Loeb in second place, 7.9 seconds adrift. Spaniard Dani Sordo finished third at one minute 17.6 seconds. "I'm incredibly happy, we had a perfect weekend, with a perfect car from start to finish," Ogier told the official WRC Web site. "We attacked from the first to the last special without making a mistake even though we were under pressure from the best driver in the rally. It couldn't have been better." 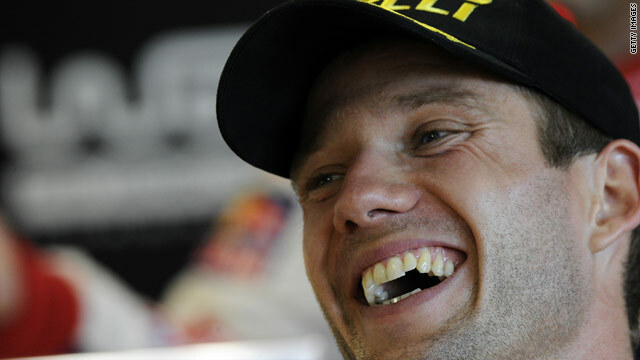 Ogier, the junior world rally champion in 2008, has moved into second place in the title standings behind the all-conquering Loeb, who has 126 points after six rounds. Ogier, who finished second in New Zealand three weeks ago, is on 88 points with Finland's Mikko Hirvonen on 76. He went into the final day with a 21.1 seconds advantage on seven-time world champion Loeb, who mounted a late charge. Loeb pulled back 14 seconds by claiming the first four specials on Sunday, but could make no further impression. 2009 championship runner-up Hirvonen finished fourth in a Ford Focus as he overtook Norway's Petter Solberg, who crashed out in his Citroen C4 in the final SS18 near the finish.